Spacey's latest movie, "Billionaire Boys Club,'' was shown in 11 theaters last weekend and collected just $618, according to the Hollywood Reporter. Kevin Spacey onstage to present Britannia Award for Excellence in Television presented by Swarovski at the 2017 AMD British Academy Britannia Awards Presented by American Airlines And Jaguar Land Rover at The Beverly Hilton Hotel on October 27, 2017 in Beverly Hills, California. "Star Trek: Discovery'' actor Anthony Rapp accused Spacey of making a sexual advance when Rapp was 14. 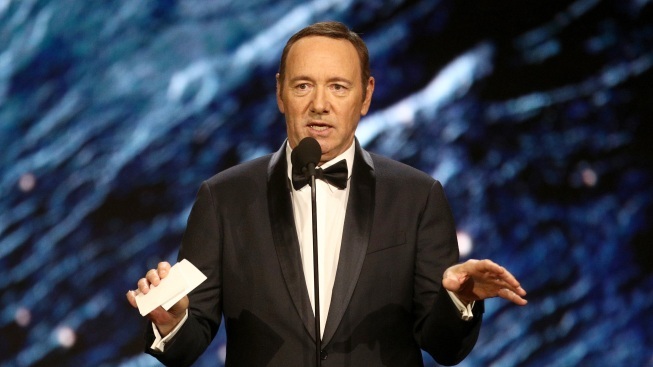 Spacey apologized, then came out as gay. Richard Dreyfuss' son, Harry, also accused Spacey of groping him in 2008. Los Angeles County prosecutors confirmed Wednesday they are reviewing a second potential sexual assault case involving actor Kevin Spacey. The Los Angeles County Sheriff's Department presented the potential case Tuesday, which is under review, according to the District Attorney's Office. No further details were disclosed. Another potential case against Spacey that was presented to the District Attorney's Office by the Sheriff's Department on April 5 remains under review, according to prosecutors. The two-time Oscar winner has been under fire following allegations by a number of men that he behaved inappropriately toward them. Spacey publicly apologized last October to "Star Trek: Discovery'' actor Anthony Rapp, who accused Spacey of making a sexual advance years ago in his New York apartment, when Spacey was 26 and Rapp was 14. Spacey said he does not remember the encounter, which would have occurred more than 30 years ago. "But if I did behave then as he describes, I owe him the sincerest apology for what would have been deeply inappropriate drunken behavior, and I am sorry for the feelings he describes having carried with him all these years,'' the actor said. Spacey then revealed that he is gay. Actor Richard Dreyfuss' son, Harry, subsequently alleged in an account on Buzzfeed.com that Spacey groped him in 2008 while he, his father and Spacey were in an apartment while Spacey was directing his dad in a play at the Old Vic in London. Netflix announced last year that it had severed all ties with Spacey and that it would not be involved with any further production of "House of Cards'' that included him. Following the allegations of sexual misconduct, he was removed from his role in "All The Money in the World'' -- a role for which his replacement, Christopher Plummer, received an Academy Award nomination this year.